Post a quote or thoughts on his books or stories. 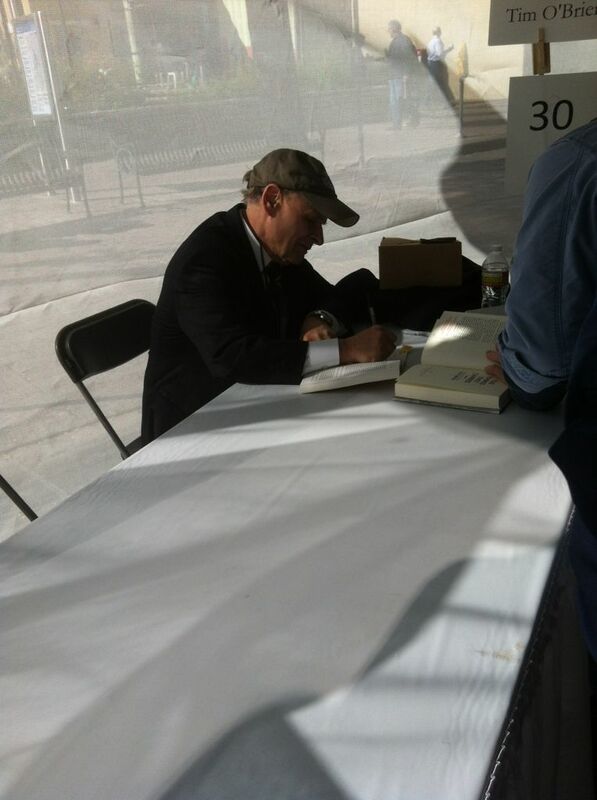 Last year at Texas Book Fest., before signing Tomcat In Love and TTTC. The Things They Carried is awesome. For me, what makes the book is when he basically interrupts the book to tell you everything that's happened in the book didn't actually happen, but that doesn't make it any less true. And then he writes an essay on truth. It gave me an interesting perspective on fiction, and I'll always appreciate Tim O'Brien's work for that. Tim - YES!!! That's one of the things that will stay with me until I die. That truth is all about preception. That it was the sunlight that killed him, and that is Curt Lemon's truth. This bit makes me want to cry and laugh and gives me all these very intense feels. Every single time I read it. Not just the first time. That's how you know it's true love. If you get the feelings every single time. This is easily in my top 5 favorite books and O'Brien is probably my favorite living author. Even if all he ever did was write that one book, he'd still be my favorite, because I think it's one of the most perfect books I've ever read. I think there was an adaptation of The Sweetheart of Song Tra Bong (spelling?) with Keifer Sutherland, though the name of it escapes me. A very loose adaptation from what I read. The Things They Carried was definitely a game changer for me, not only in the way I write but they way I perceived storytelling, and the ways now open for me to tell some of my personal stories. I carry a copy everywhere, and will always remember the first time I read it. I've heard of that. It was my least favorite story in the bunch, so I'm not all torn up to find it and watch it. It would be the most adaptable, in my opinion. I can certainly imagine films being made of the individual stories. Which brings me to one of my favorite lit-geek pet peeves: that The Things They Carried is so often labeled a short story collection rather than a novel. Tim O'Brien said it was tough to label it one or the other (though it was written over the years as individual stories, parts were rewritten when it became a whole), and it was usually called a "composite" novel at the time (not sure if he came up with the term, or critics), which is a term I kind of like. Anyone else geeky about this? It just seems far richer to me to be approached that way. I, uh, well...I've never, ah, actually, that is, I didn't know it had been called anything but a novel. BUT, I will say that of all the non reading retards to whom I've chanced to bring this book up, a surprising number actually know (or know of) this book. I attribute this to him teaching at a university around here.